From the Soldier's point of view, the American Civil War was not a continuous battle. Instead, it was long monotonous marches and long residency in camps punctuated by the terror and chaos of combat. When winter set in and the campaigning season came to a close, most Soldiers counted on a long, cold stay in a winter camp. 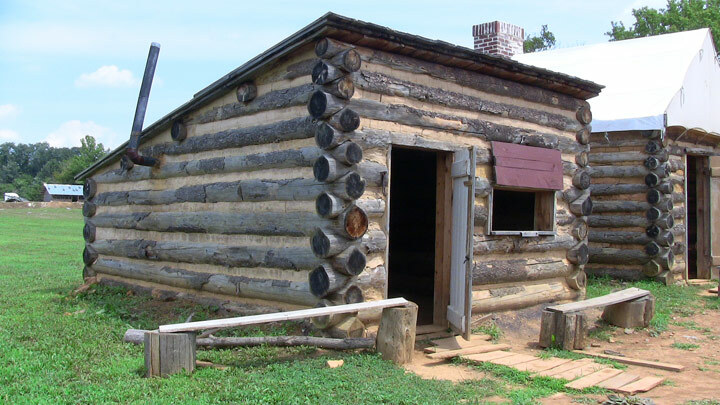 The four log cabins at the center of the Army Heritage Trail represent the types of buildings which Soldiers in both the Union and the Confederate Armies spent the long dreary months of winter. 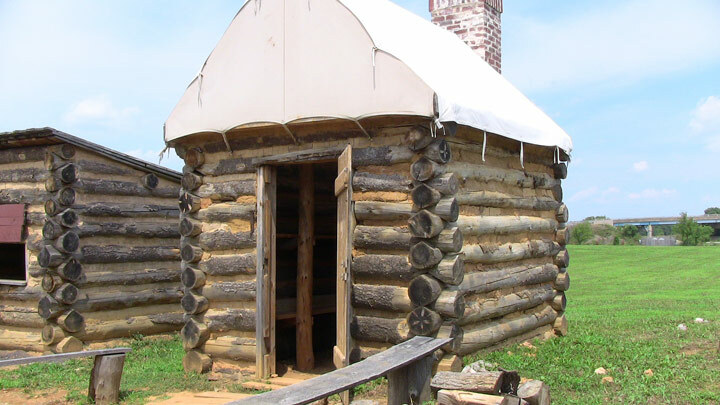 The cabins are modeled after images from the USAHEC collection, including the Army of the Potomac's winter camp at Brandy Station and the Confederate camp at Centerville. When facing the cabins, the furthest left represents a cook's house, where a unit's food was cooked and served. The middle two cabins represent enlisted men's barracks. The fourth is an example of a cabin an officer might have lived in. The American Civil War was a long, bloody conflict punctuated by horrific pitched battles. Soldiers marched for days and weeks at a time to reach battlefields, carrying their entire lives on their backs or in following wagon trains. 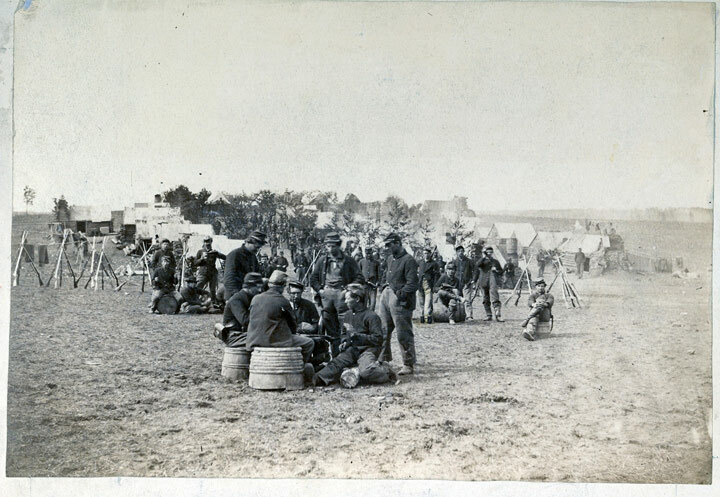 While battles and marches were part of the Civil War Soldiering experience, the majority of a Soldier's life was spent in a camp. Camps were both long-term and short, and could be as simple as half-shelters of canvas in a field a few miles from the battlefield. During the lull in marching and fighting during the winter months, Soldiers built full-fledged log cabins to keep snug against the cold. Life in a winter camp was by no means easy; rather, it was an extension of the hardships of being a Soldier during the American Civil War. Each winter camp was different. Some camps were orderly, with cabins or tents lined in neat rows with each building the same as the one before it. Others were haphazard arrangements of tents, cabins, and cabins with tent roofs. Each building style was different as well. Some structures were no more than a hole dug into the earth with a tent over top, while others were multi-man cabins complete with fireplace, chimney, and bunks. The typical cabin was a simple affair. Soldiers cut logs from the surrounding country side, built their cabins next to brick and mortar chimneys, and roofed the buildings with tent canvas. Interestingly, the style of cabin sometimes pointed to the ancestry of the builders. 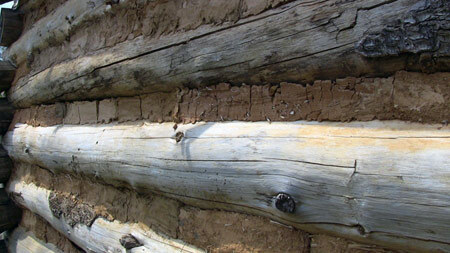 For example, Soldiers of Scandinavian descent generally built their cabins with the logs vertical, while those of German descent built with the logs horizontal with notches at the corner to minimize the use of nails. Whatever the building style, Soldiers spent long hours chinking between the logs with mud or mortar to keep out cold drafts and to conserve heat from the fire place. If a nearby town was available and glass or oiled paper could be obtained, fortunate Soldiers would have the luxury of windows. The interior walls of the cabins supported bunks and furniture made from whatever materials the men managed to gather. Bunks were constructed of saplings, boxes and crates, and hay or leaves for a sleeping surface. When bed-time rolled around, most Soldiers stripped to their flannel underwear before climbing into the bunk, while others stayed completely dressed, never removing clothing for months at a time. Whether they slept in their boots or not, each Soldier was issued a rubber blanket and a woolen blanket. Most troopers placed the rubber blanket directly on their bunk for protection from drafts coming from underneath, and then covered themselves with the heavy woolen one. On the coldest of nights, Soldiers slept two or three to a bunk to take advantage of shared blankets and body heat. A Soldier's living quarters was the center of his daily life. He awoke early with reveille and mustered for the first roll call of the day. When the weather allowed, the Soldier's time was taken by regimented drill and training. 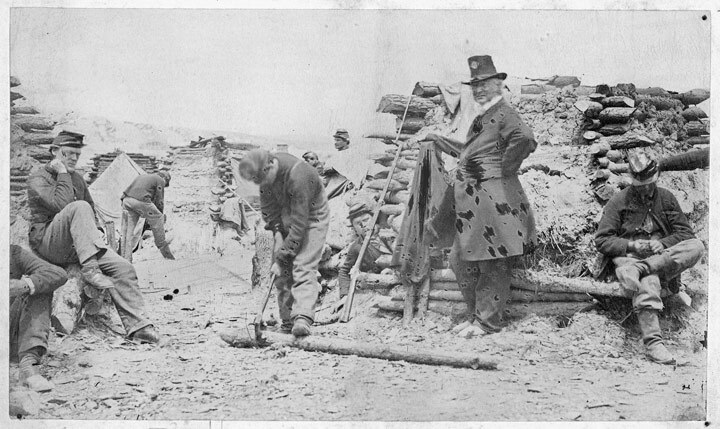 Officers took advantage of the winter months in cabins to put their men through the close-order drill required in Civil-War era fighting. Masses of Soldiers trained for endless hours, learning to quickly line up, march in time, wheel as a unit to respond to flanking attacks, to fall in and out of battle lines, and otherwise maneuver in battle. Soldiers learned to charge, defend, and fight as a unit. Generals held massive mock battles, regimental and battalion officers put the men through small unit movements, and company level commanders held target practice and personal combat classes. When a Soldier was not actively training, he spent his free time at his quarters. The first and most important task a Soldier faced when his free time rolled around was to fill his belly the best he could. Food in camp was a very different affair than on the march. During the campaign season, troops either ate limited rations or foraged from the local area, sharing their bounty with men in their unit. In camp, however, most of the rations were sent to a central kitchen hut to be prepared by a regimental or battalion cook. Such an arrangement was a mixed blessing, however. Quartermasters and cooks sometimes filched the best cuts of meat, the best portions of coffee and sugar, and the freshest vegetables for themselves or to give to officers to curry favor. Soldiers tried to supplement the meal they received from the kitchen with self-cooked scrounged food in their cabins. Once hunger was assuaged, a Civil War Soldier went about filling his extra time with chores. Clothing needed repaired, the cabins had to be maintained, and weapons had to be cleaned and serviced. For the men who were so inclined, cleanliness was the next order of business. The grimy nature of hundreds or thousands of troops packed into close-quarters during long winters led to constant lice infestation. Soldiers regularly took a buddy into the woods to pick lice from one another. When an infestation was out of control and new uniforms were available, many simply burned their old clothes. When uniforms were scarce, boiling was the only other way to kill the lice and their eggs. In some cases, the kitchen hut, with its large cooking kettles, doubled as a wash room in which lice-infested clothes were boiled to rid them of the miniscule varmints. When drill and chores were completed or when the winter cold was too sharp to train, Soldiers spent the rest of their time looking for entertainment. Literate Soldiers read by candle light when candles were issued, and 'slush lamps", made from cooking grease and a cloth wick when candles were scarce. Even the illiterate Soldiers gathered around bibles and primers to learn from their educated comrades. In addition to reading, Soldiers gambled if they could get away with it or played homemade board games. Most camps had lively political discussion groups, as well. Soldiers with a gift for gab became "camp walkers", wandering the camp and picking up rumors from each cabin and campfire. When the various rumors were assembled and compared to the general orders from the command, local newspapers, and letters from home, the discussion groups could form an accurate picture of their place in the war and how it was proceeding. While enlisted Soldiers were packed into their cabins and spent their extra time avoiding hunger, officers generally had a better lot in life. Many officers had their own cabins or shared with only one other man. The floors were wooden rather than packed earth, and if the officer could afford it, he slept in a proper bed in lieu of the cobbled together bunks in the enlisted cabins. In some cases, officers even paid to have their wives and children travel to the camp to spend the winter. Officers were also allowed more room in the baggage train, so they generally had more possessions to fill their cabins, as well. The officer's cabin served as his sleeping quarters, office, and sometimes even as a headquarters. 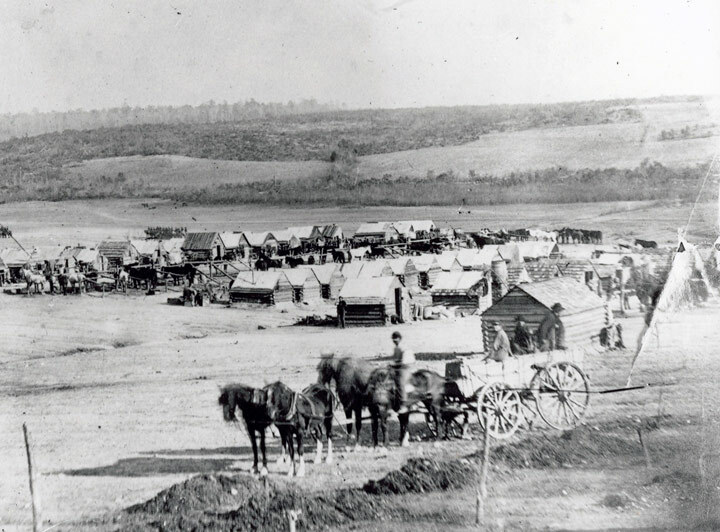 The camps used by the Confederate and Union forces during the winter months were not permanent, despite their sturdy construction. When spring arrived and the next campaigns were planned, the Soldiers packed their bags and burnt the buildings to deny the camp's use to the enemy at a later date. The fighting men of the Confederacy and the Union marched away from their winter home, ready for the hard battles in front of them. 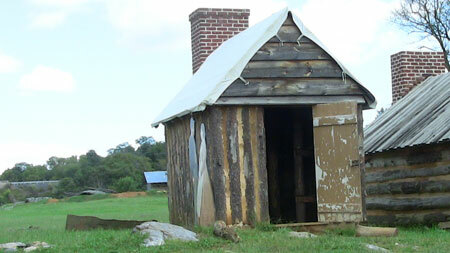 The Army Heritage Trail features an example of the various types of cook houses built in winter camps on both the Union and Confederate side of the Civil War. Officers generally lived in better-quality cabins than enlisted men. 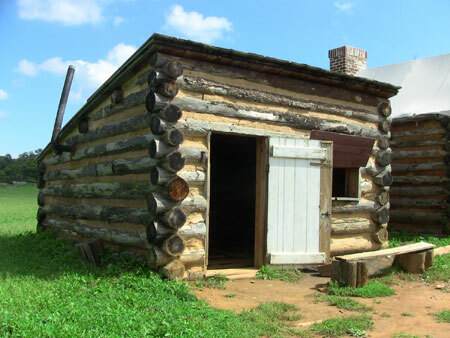 This cabin, built for the officers in the headquarters of the Army of the Potomac, has a well-built brick chimney and thick hewn timbers for walls. The photograph shows the Commissary Department at the Headquarters of the Army of the Potomac in Fairfax Courthouse, VA. 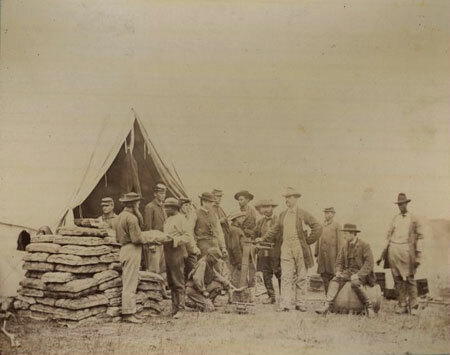 The gentleman with his hand on the scale is Captain John R. Coxe with his staff. The large stacks of freshly baked loaves of soft bread were prepared for issuance to the troops. 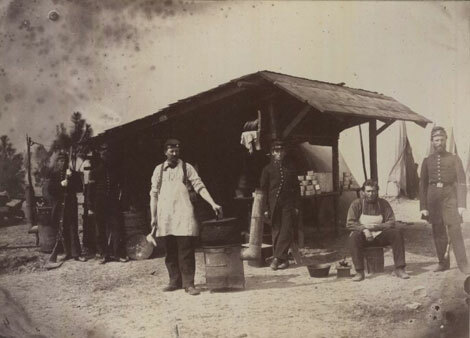 This photograph shows a different version of a cook house during camp in Hilton Head in 1862. Pictured from left to right is J.N. Campbell, Corporal McQueston, General Wheeler, A.H. Stevens, W. Blake, and Captain W.H. 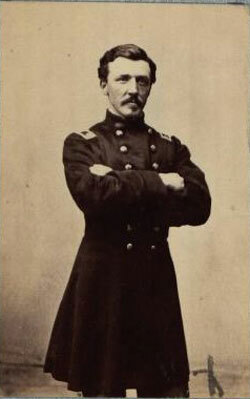 Maxwell of Company H of the 3rd New Hampshire Infantry. The Company cooks are wearing the aprons, while the other gentlemen are most likely waiting for their food or coffee to be ready. 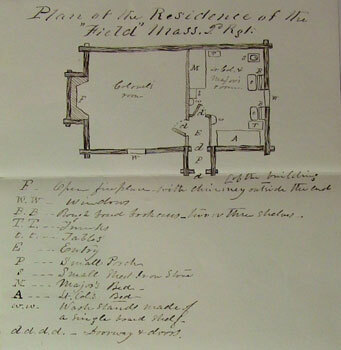 Sketch of the cabin shared by COL Andrews and LTC Dwight during the winter of 1861-62, from the papers of COL Andrews. 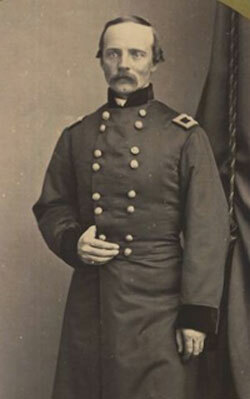 The description of the building is from a letter written by LTC Dwight. 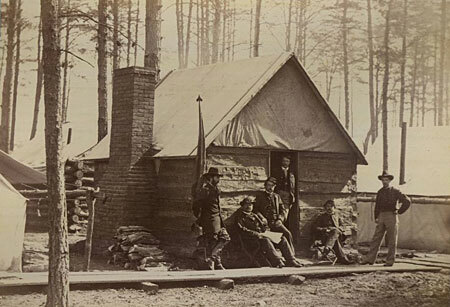 The center of a Soldier's camp life was the enlisted winter cabin. Cabins provided living space, sleeping space, and a warm retreat during the winter months. 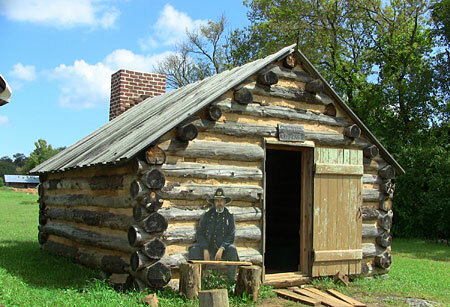 The Army Heritage Trail features an example of the type of cabin an officer in the Armies of the Union or the Confederacy might have lived in during the winters of the Civil War.